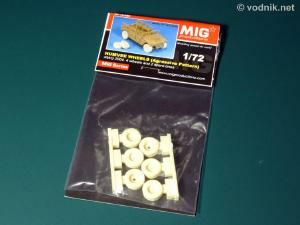 The set from MIG Productions includes six resin wheels (two of them spares) to replace those included in Revell 1/72 scale Humvee kit. Original Revell kit includes old style pattern tires, while MIG parts are cast with newer "aggressive" tread pattern. Please note that while in Revell kit you get two complete Humvee models, MIG parts includes enough wheels for only one model (four wheels + two spares). While the wheel set is described "Iraq 2004" on the label, the aggressive pattern wheels were in use for several years before Operation Iraq Freedom started. On the other hand old style tread pattern tires are also still in use. The set is packed in a plastic zip-bag with a stiff paper flab stapled to it. 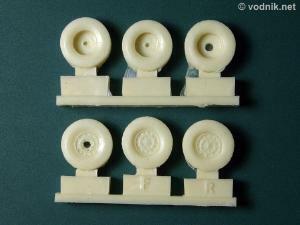 In the bag are two identical resin castings, each including one front, one rear and one spare wheel. This means that left and right wheels are cast identically and this results in tread pattern on the left side of the vehicle pointing to the opposite direction from that on the right side wheels. This is actually correct, as tires on real vehicles are usually put on like that. One reason for it is to make the direction of travel difficult to read from tire marks on the ground. The tread pattern on tires is generally accurate, although obviously simplified in this scale. The number of bolts on rims is also correct for new type rims. Wheel hub details are barely marked, but they are different for front and rear wheels, as they should be. The tire diameter of 12.5mm also seems to be about right in 1/72 scale. Wheels are not bulged nor weighted. 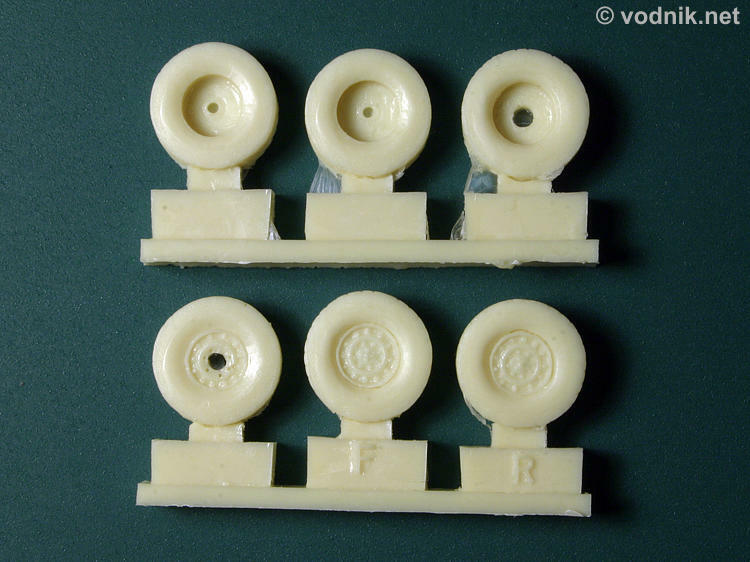 On the back side of each wheel is a small hole in the middle of each rim, which I assume fits to the pin on the axle parts of Revell kit. Unfortunately I don't have Revell kit, so I don't know if any modifications are necessary to attach MIG wheels, but this hole on the back suggests that they replace kit parts directly. Spare wheels have a larger hole through the rim in place of wheel hub and eight bolt heads around this aperture are also replaced with small holes. Most of these holes are fully or partially filled with resin and will need to be open with suitable size drill bit, but it is easy job. Click on picture to enlarge it. Close-up of wheels. Note the gap above the rim. There is only one air bubble on one of the spare wheel rims - other parts are blemish-free. 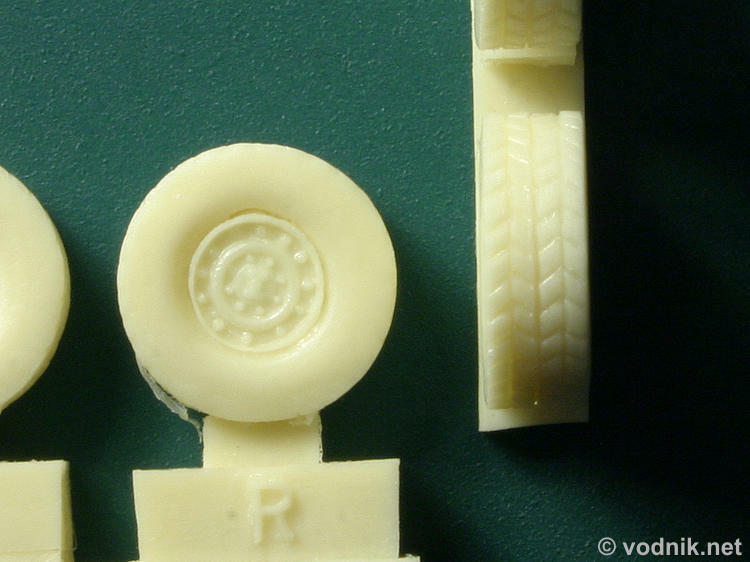 This one tiny hole may be difficult to fill without damaging some details around it, but as two spare wheels are included in the set, it should not be a problem. There is a bit of flash on parts, but it's easy to brush off. Resin pouring blocks should be easy to remove, but at the area where they contact the wheel some of tread pattern is lost. This is not an issue as these area can be positioned on the bottom of the vehicle and not visible. Only on spare wheels it could be a minor problem, requiring restoration of this lost pattern, but it depends on the way one plans to use these spares. On a couple of wheels there is a gap between the rim and tire. It is not big and can be ignored, or filled easily with thin putty of gap filling superglue. As I mentioned earlier the early pattern wheels are still in use, but aggressive pattern tires are now much more common. This means that MIG Productions set is a welcome addition to Revell Humvees (and probably also for coming soon Dragon ones), particularly if you want your model to represent typical KFOR, OEF or OIF vehicle. Highly recommended!